Since we didn’t know each other at this time last year, I have a confession. I love watching awards shows. Well, most of them anyway. Golden Globes, Grammys, Academy Awards, Emmys and Tonys for certain. When I can, I also like to watch the “red carpet” arrivals as well to get a glimpse of the stunning gowns most choose to wear (attire at the Grammys is a different story). Although here in New England, this weekend represents the first playoff game for our beloved Patriots, for me it also marks the official “kick off” of the red carpet season! “The Globes” will air this Sunday night on NBC, hosted for the third and I think final time by the reigning queens of comedy (in alphabetical order), Tina Fey and Amy Poehler. These two women are extraordinarily talented comediennes, writers, producers and businesswomen. They make me laugh out loud. Fun fact about Amy Poehler – she was just chosen to receive Harvard’s Hasty Pudding Theatrical’s 2015 woman of the year award so she will be here in Boston to be feted on January 29th! You probably know that Amy went to Burlington High School and Boston College. Local girl – woop woop! Ironically, I am grateful to Amy Poehler. Let me tell you why. A few years back, my daughter and I went on a “college trip” to Los Angeles during her spring break. It was definitely a serious exploration of four schools in three days. But truth be told, we also had other things on our mind, like a possible chance meeting with a celebrity or two. We were not demanding and would have been happy seeing someone at LAX in their baseball hat. Now, the only time I had visited LA previously had been right after college when my parents took us on a trip to California which included several stops, including one in Beverly Hills. We were at dinner one night and were seated next to Bruce Springsteen and his first wife, Julianne Phillips. I remember she was wearing really large hoop earrings. It was the 80’s, what can I say? I couldn’t wait to get back to our room to phone my pal, Rick as he needed to know how close I came to the Boss, one of his idols. If this were today, I would have texted him under the table no doubt. Maybe that was just lady luck, but I was optimistic that my daughter and I would see someone famous during our stay. And it didn’t count that on the first night at dinner in our lovely hotel, we were seated next to this guy. Ugh. Opportunity did knock, but unfortunately my daughter was in the room when I stepped into our hotel elevator, only to look up and see Martha Stewart and a very tall assistant sharing the space with me. The doors closed and it was just the three of us – me holding my breath. Finally, Martha said something – to her assistant – who I remember was carrying an extraordinarily large pile of books and papers while Martha might have been holding her purse! It was one of those completely awkward moments when you know, that they know, that you know who they are and just want to say, “I’m a big fan!”. I was just grateful I didn’t trip getting out of the elevator. As far as I was concerned, I saw my celeb, but my daughter still needed a siting! So, it was our last day, the school visits were done and we were ready to go home. We decided to go to one final lunch here. It’s still one of the places where deals get done in LA. We sat down and ordered our meal. We were quite sure everyone in the room was somebody, but none of them were recognizable to us. And just when we thought we had struck out, Amy Poehler came rushing in. She was clearly late as her dining companion was already seated, but she was like a breath of fresh air. Carrying a huge handbag (my kinda girl), she sat down and got right to business. Jackpot! Of course, we had to text daughter #2 at home who is a huge Amy Poehler fan. And who knows? Since it was 2012, perhaps she was negotiating her deal to host the Globes! You never know! In any case, we were so happy that we could get on the plane and fly home with a story. So, thank you AP for being there when I needed you! 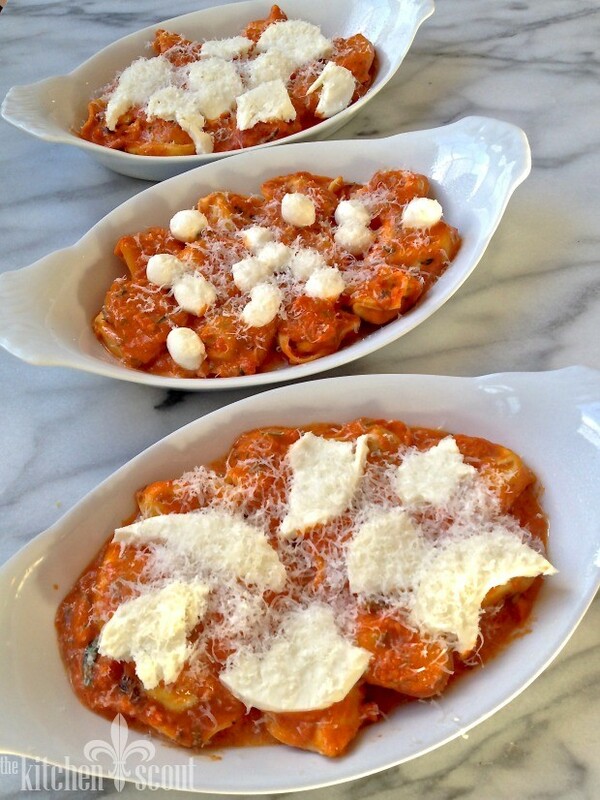 In homage to another LA celeb, the chef you know I love and who made a big announcement on her website recently, I am sharing one the easiest baked pasta recipes that I have been making for a long time. Cheesy Baked Tortellini is a one pot comfort food dish, perfect for the frigid temperatures we’ve been experiencing in New England. It is also a meal that you can throw together in a flash, and will be perfect for my friends who ski every weekend and need to switch up the slow cooker options. 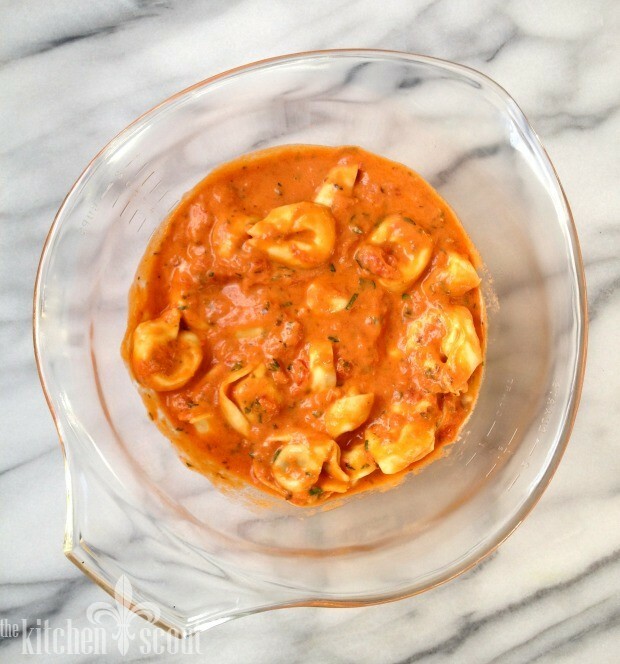 Cheese tortellini is tossed in a creamy sauce made from marinara, mascarpone cheese and herbs. Giada’s original recipe suggests topping the pasta with smoked mozzarella, but I have always made mine with fresh mozzarella for a more traditional flavor. I’ve actually increased the recommended amount of cheese and added some fresh basil to finish off the dish. 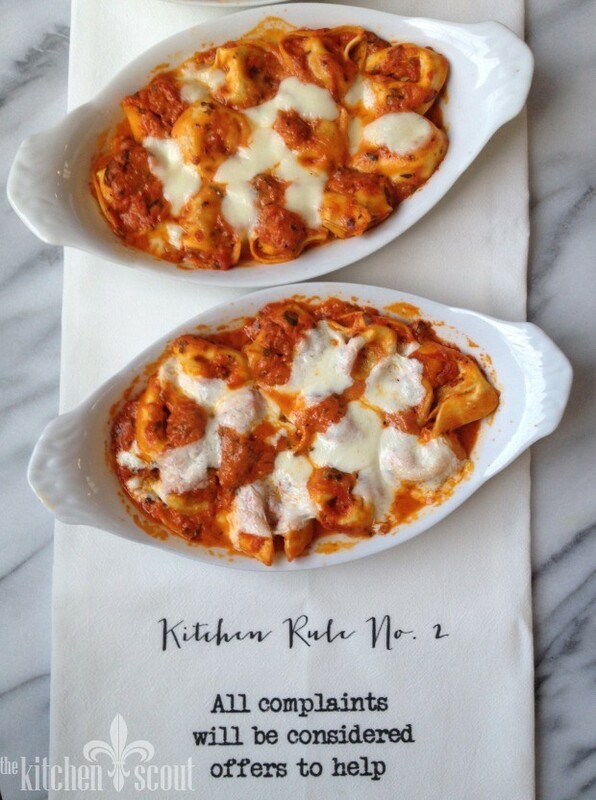 The recipe is very flexible and you can use tortellini with other fillings (I used sausage this past week) or even ravioli if you have them. You could also cook some diced pancetta and add it to the sauce, or some turkey sausage links that you cut into bite size pieces. It is a very flexible recipe for sure. And just for reference, I made the dish over vacation week and four reasonably hungry adults finished it in one seating. I hope you make it soon. Maybe when you’re watching an awards show like me sometime soon! Enjoy! 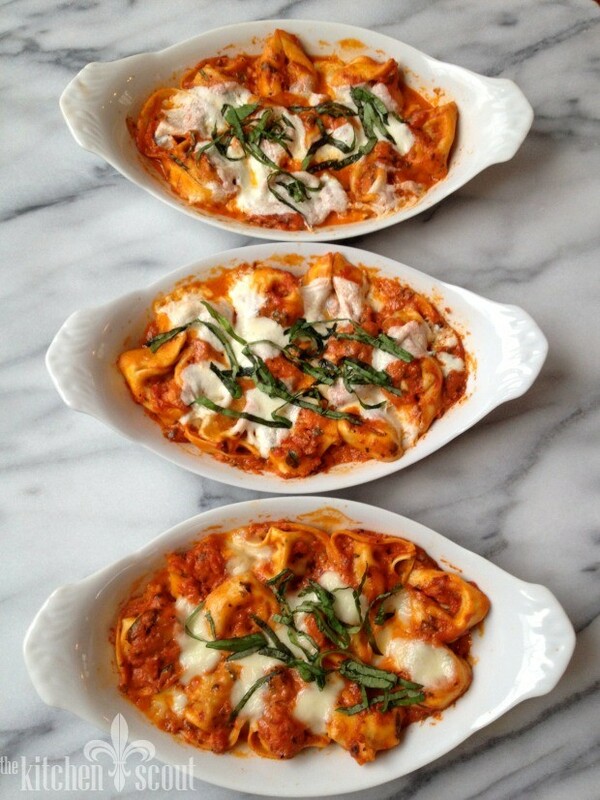 The pasta is placed in a baking dish and covered with mozzarella and parmesan cheeses. 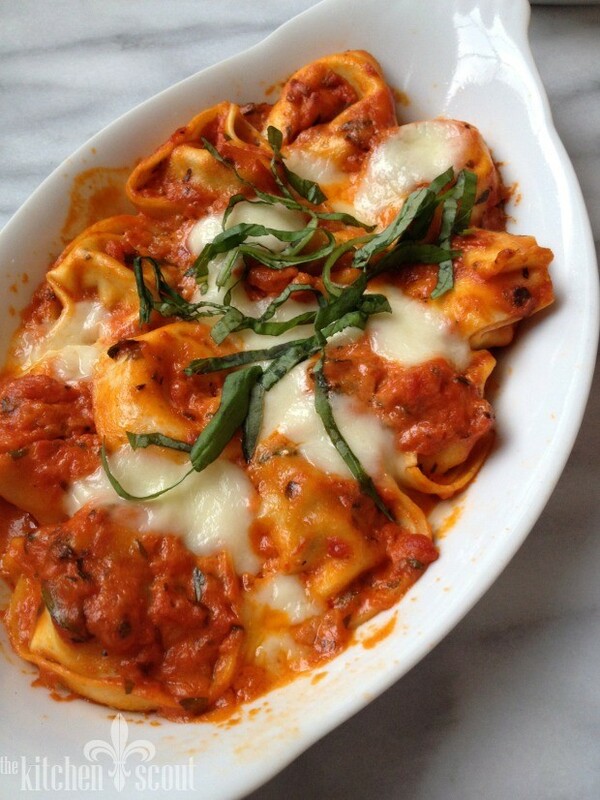 Thirty minutes in the oven and it’s ready to serve. Preheat the oven to 350 degrees. Lightly grease an 8 inch baking dish with olive oil or non-stick cooking spray. 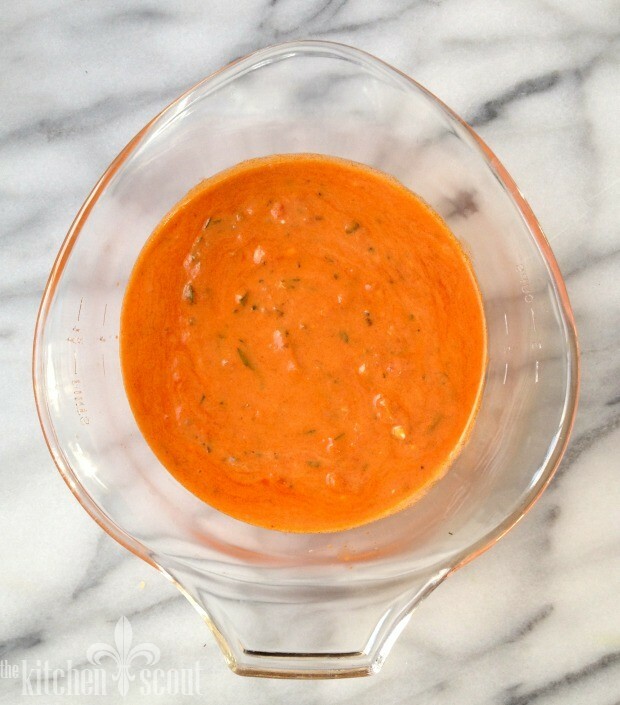 Whisk the sauce, mascarpone cheese, parsley and thyme in a large bowl to blend. Cook the tortellini in a large pot of boiling salted water just until tender, about 2 minutes. 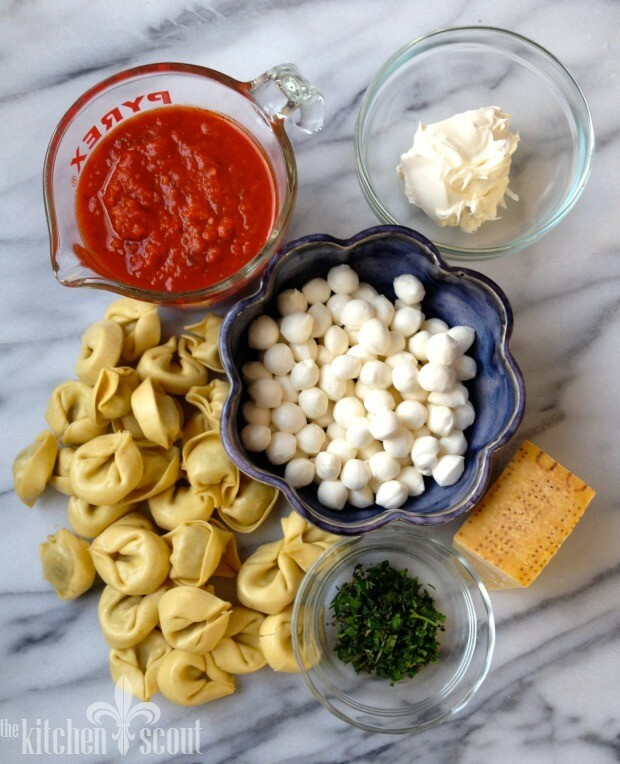 Drain and add the tortellini to the sauce and toss to coat. Transfer the tortellini mixture to the prepared baking dish. Top the mixture with the mozzarella cheese, breaking up the pieces if necessary to get good coverage and with the Parmesan. Cover the dish with foil and cook covered for 20 minutes. Remove foil and continue to cook for an additional 10 minutes until cheese is melted and lightly browned. 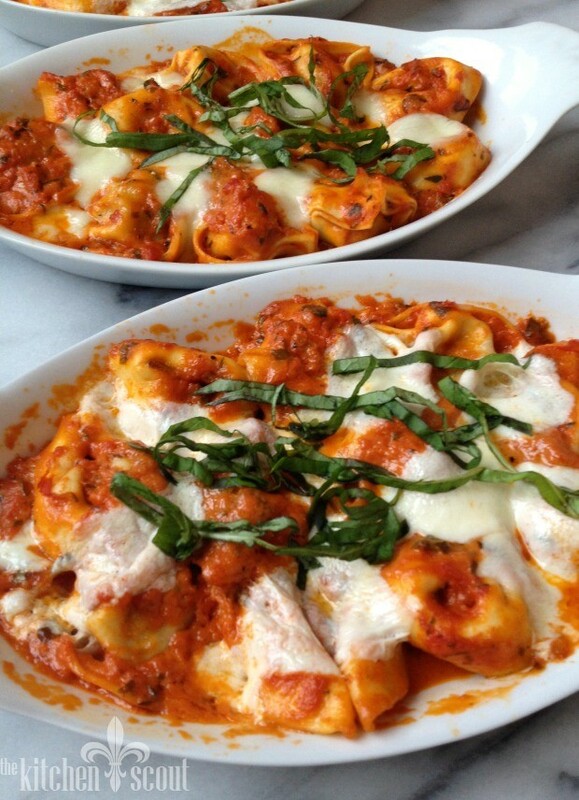 You can use any kind of tortellini you like, including varieties with chicken or meat. 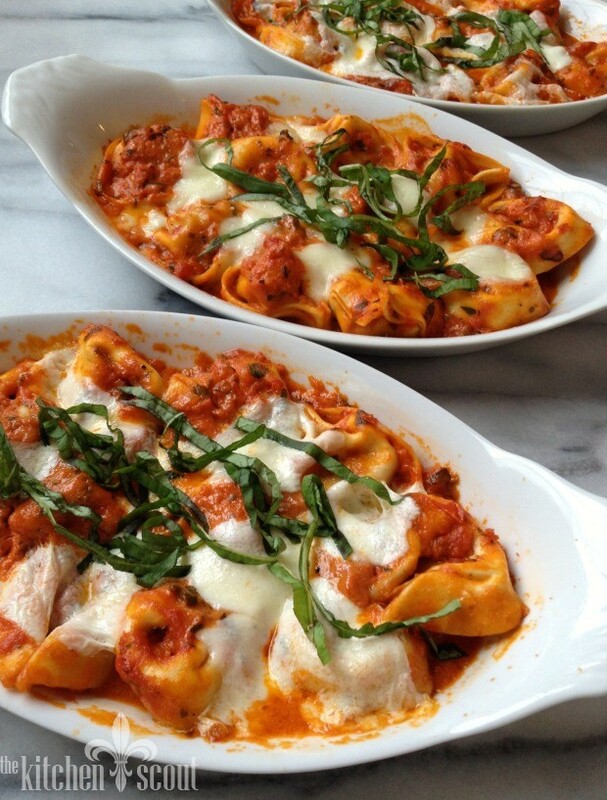 Fresh tortellini generally comes in 9 ounce packages and a large package is 20 ounces. 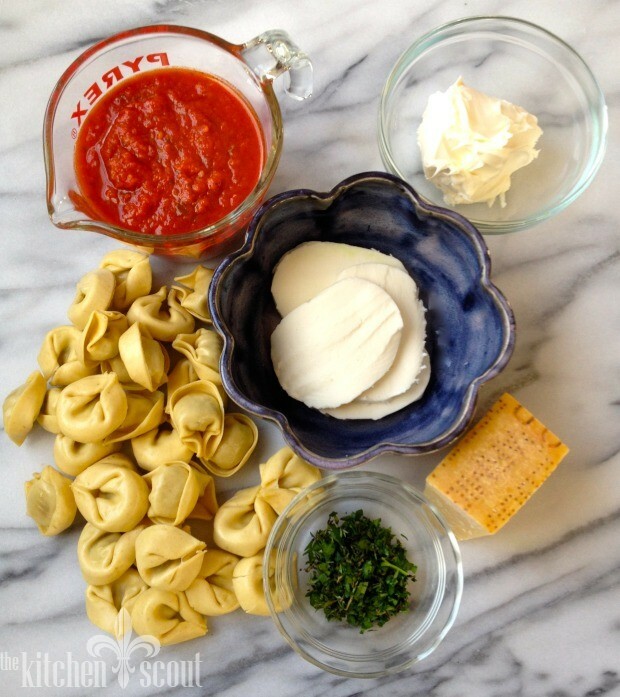 The recipe was originally written using 1 pound of tortellini, but I have had good results adding in a few extra ounces. You can also add a little extra marinara sauce to the mixture if necessary. Any thoughts on cooking classes from time to time? It would be a fun activity for a cold New England afternoon…..